Does anyone else start to feel the pressure as we head into the holiday season? Why do I do this to myself every year? Do you feel the pressure to have the perfectly decorated house, the most delicious Thanksgiving meal, and of course, the perfect party dress? Anybody else reading my mail? As we enter into the holiday season this year, I crave for things to be different. I am passionate about the saying “I AM ENOUGH.” I want to believe this statement and trust Him in the process. Because of what our incredible Christ has already done for us; yes, YOU are adored by a faithful God. What amazing news that is and what a relief when we can actually believe in our hearts what is true about who we really are! That is why my life mission at this stage in life is to inspire women to transform not only their physical bodies, but their entire lives. Our goal is to help women overcome the lies that we all battle everyday of “the perfect life” and to embrace the gifts they have been given to be able to walk in confidence in who they were meant to be! Our annual contest Holiday Extravaganza helps us to maintain our weight over the holidays. Why do we do it? Because we are called to give our best with what we have been given or should I say gifted? We are called to glorify Him and love others well. We can do this when our physical bodies are at their best. You are right, physical transformation is the before and after photos of women losing 50 pounds. We know that good nutrition and proper exercise can lead to weight loss; however, losing weight is not what life is all about. Losing weight or getting to a “number” on the scale doesn’t lead to true happiness. It’s a fleeting jolt of bliss but will never lead to real joy. Real transformation has little to do with our body shape and has everything to do with the truths we are putting deep in our hearts and minds. When His word permeates through our veins daily we can have a genuine life change, and enjoy the process of transformation daily. It’s this transformative journey where we experience deep relationship and the true joy with our God and our community. How the truths seep into your veins is not by some physical activity that you do, or by some kind act you performed. The process of transformation is something He does in you over time. 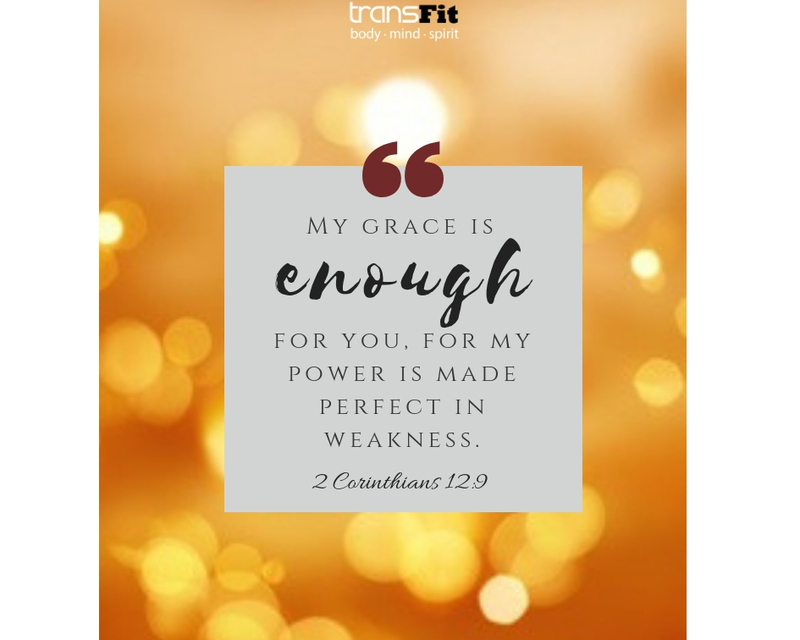 2 Corinthians 12:9 reminds us, “My grace is sufficient for you, for my power is made perfect in weakness” Therefore I will boast all the more gladly of my weakness, so that the power of Christ may rest upon me.” He grants us grace when He formed us specifically in the palm of His mighty hand. 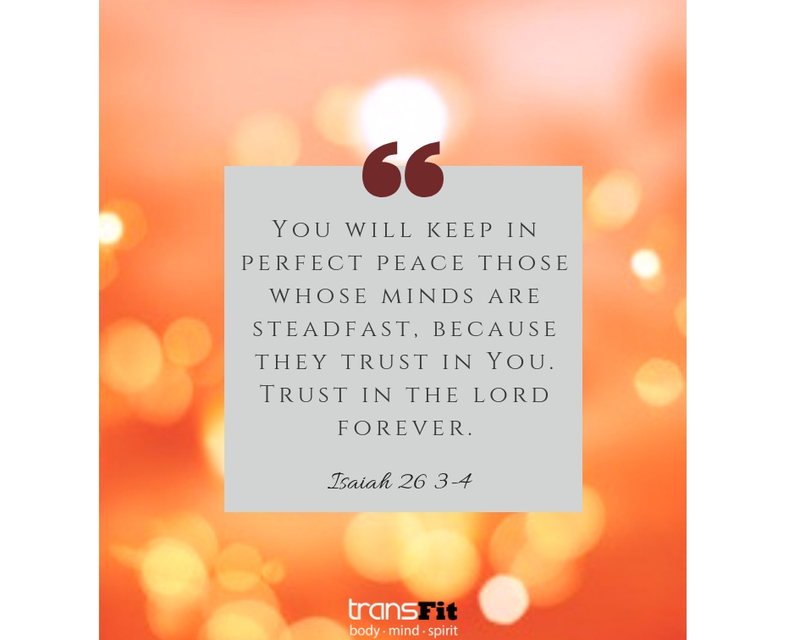 He is the one who will transform you from the inside out. He can replace the lies that we have to be perfect with the truth that we are cherished and adored. Enough. I started this business 8 years ago because my mind was leading me in all the wrong directions, and I was in a pit of depression and despair. I had fallen prey to the “not perfect life” so it’s “not worth it life.” However, what was “perfect" in the world was not real. God transformed my life by instilling real truths about my body, my “perfect life”, and what really should be filling my soul. Why is it hard for us to accept this and live this out? And how do we do this, really? We start by seeking self-respect, security, and significance in Christ. We start to know Him, spend time with Him, and love Him to be able to truly love ourselves. Silence that inner critic who says you can’t, you won’t or you aren’t…because YES you are imperfect; we all are, but YOU ARE ENOUGH. Because of Him, you are worthy, you are loved, you are strong enough to get though whatever comes in your life journey. So my challenge to you is this: start treating yourself with love, self-respect, and significance. You were fearfully and wonderfully made and specifically designed for an amazing life purpose. You are loved and you are enough. You are enough, and you are adored by a mighty and powerful King. How can we help you, care for you, pray for you? Our staff wants to know you, connect with you and encourage you. Please reach out to us at transfitathens@gmail.com. We would love to schedule one-on-one time for coffee, or a walk or healthy lunch! Join us for the Most Transformational Challenge to Finish 2018 Strong!